On this date in 1863, two men were shot* on the beach at Johnson’s Island in Lake Erie, site of a Civil War prison. Their crime: recruiting for the Confederate army behind Union lines. William Corbin, from the 1897 A Short History of the Soldier — Life, Capture and Death of William Francis Corbin: Captain Fourth Kentucky Cavalry, C.S.A. After a short-lived attempt to maintain a posture of “armed neutrality” vis-a-vis the Civil War combatants, Kentucky became the uncertain and bloodily contested frontier march between the rival governments. With the 1862 invasions of Kentucky by armies North and South, sides had to be chosen. Corbin enlisted with some local militia mates in the Confederate army; after wintering in Virginia, he was dispatched back to his native Campbell County, Ky. — now under Union control — to beat the bushes for more Confederate enlistees. With him was another Campbell County native son now serving in the Southern army, Jefferson McGraw. In April 1863, a Union patrol out hunting Confederate guerrillas accidentally caught wind of the recruiters’ activities and followed McGraw to the Rouse’s Mill safe house where he was to rendezvous with the waiting Corbin. Not to be confused with Order 66. This book has a chapter about the Corbin-McGraw case. Again, General Order 38 postdated Corbin and McGraw’s arrest. They had expected, and perhaps were even directly assured by their captors, to be treated as regular prisoners of war. On the other hand, Order 38 aside, these men were undoubtedly working covertly behind Union lines, and risked harsher treatment on that basis alone. At any rate, the two were condemned to die by a military commission in Cincinnati for violating Order 38 by recruiting behind Union lines. Neither Gen. Burnside nor Abraham Lincoln himself — who were both besieged by petitions for clemency — would consent to spare them. 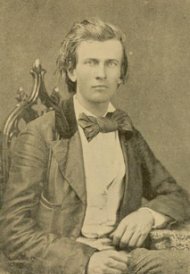 After reading and prayer by Captain Corbin, he said, in part, speaking of himself, that “life was just as sweet to him as any man, but if necessary for him to die in order to vindicate the law of the country, he was ready to die, he did not fear death; he had done nothing he was ashamed of; he had acted on his own convictions and was not sorry for what he had done; he was fighting for a principle, which in the sight of God and man, and in the view of death which awaited him, he believed was right, and feeling this he had nothing to fear in the future.” He closed his talk by expressing his faith in the promises of Christ and his religion. To see this man, standing in the presence of an audience composed of officers, privates, and prisoners of all grades, chained to and bearing his ball, and bearing it alone, presenting the religion of Christ to others while exemplifying it himself, was a scene which would melt the strongest heart, and when he took his seat every heart in that audience was softened and every eye bathed in tears. * Corbin and McGraw were set up for execution seated on the edges of their own coffins, so that the force of the firing detail’s barrage would knock them conveniently back in. That’s efficiency. ** General Order 38 also resulted in the arrest of an Indiana legislator named Alexander Douglas. Douglas beat these charges thanks to the energetic defense mounted at the tribunal by his neighbor, attorney Lambdin P. Milligan … and the fame thereby falling to the latter man would eventually help to fix his own name into the jurisprudential firmament as the subject of the landmark Supreme Court ruling Ex parte Milligan. For more background, see this pdf. † Nobody else was ever executed under General Order 38.